BACKGROUND AND PURPOSE: Ionic solutes diffuse more slowly in cartilage than do nonionic ones. The purpose of this study was to test the hypothesis that the contrast between scar and recurrent herniated disk fragment on MR images is greater after the IV administration of an ionic rather than a nonionic contrast medium. METHODS: Patients who had undergone previous laminectomy and who had MR imaging evidence of recurrent herniated disk were enrolled in the study and underwent lumbar MR imaging with the nonionic medium gadodiamide and on a subsequent day with the ionic contrast medium gadopentetate dimeglumine. Enhancement of scar and disk was measured by one of the investigators as the ratio of signal intensity change from baseline to the baseline signal intensity and was plotted as a function of time. Differences in enhancement for scar and disk fragment for the two contrast media were tested for significance by using the Student t test of the means. RESULTS: Eight patients were enrolled in the study and were studied with the two contrast media within 4 weeks. The average enhancement of the disk fragment at 5 minutes was 0.1 with the ionic medium and 0.4 with the nonionic medium. The difference was significant at P < .05. Contrast between scar tissue and disk tissue was greater with the ionic than with the nonionic medium at both 5 and 20 minutes because of the lower concentration of ionic contrast medium in the disk fragment. CONCLUSION: With clinical imaging of patients with recurrent herniated disks, disk fragments enhance less after the administration of an ionic rather than a nonionic medium. Contrast between disk fragment and scar tissue is greater after the use of an ionic contrast medium than a nonionic one. In theory, ionized solutes diffuse more slowly in cartilage than do nonionized solutes. The fixed negative charges in glycosaminoglycans, a major constituent of disk and other cartilage, slow the diffusion of charged particles or ions through the cartilage. This principle of diffusion explains the greater efficacy of uncharged, nonionizing antibiotics in the treatment of diskitis than charged ionizing antibiotics that penetrate poorly into disk cartilage. Therefore, in principle, paramagnetic contrast media that have a charge should diffuse less readily in cartilage than contrast media lacking a charge. With MR imaging, contrast medium is used to increase the conspicuousness of recurrent herniated disk fragments in patients with recurring pain after laminectomy. On unenhanced T1-weighted MR images, scar and disk fragment have similar signal intensities. When paramagnetic contrast medium is administered intravenously, scar enhances because it has a blood supply, a fenestrated capillary endothelium, and an extravascular space. Disk enhances minimally because it has no blood supply. However, contrast medium diffuses into the cartilaginous disk fragment with the result that contrast between the disk fragment and scar progressively diminishes. For the detection of recurrent herniated disk fragments, the relatively slower diffusion of contrast medium into the disk fragment should hypothetically create relatively greater contrast between disk fragment and scar. In animals, contrast enhancement can be measured in normal intervertebral disks. In an animal model, enhancement of disk cartilage is approximately twofold greater with a nonionic medium than with an ionic one (1). In an animal model of recurrent herniated disk, use of the ionic medium produces significantly greater contrast between disk fragment and scar than does use of a nonionic medium (2). Therefore, we designed a study to test the hypothesis that in human MR imaging, greater enhancement of the disk fragment occurs with nonionic rather than ionic media. We compared the enhancement of scar and disk fragment in patients having lumbar MR images with an ionic and a nonionic medium. To improve the power of the study, the contrast enhancement of disk fragment and scar was measured at two time points after the administration of contrast medium. With the approval of the internal review board, patients for the study were recruited from consecutive patients referred for contrast-enhanced MR imaging of the lumbar spine because of suspected recurrent herniated disks. These patients were studied with a series of images, including sagittal T1-weighted, sagittal T2-weighted, and axial T1-weighted and then repeat axial T1-weighted MR images obtained 5 minutes after the IV administration of gadodiamide (Omniscan, Amersham Health, Princeton, NJ). 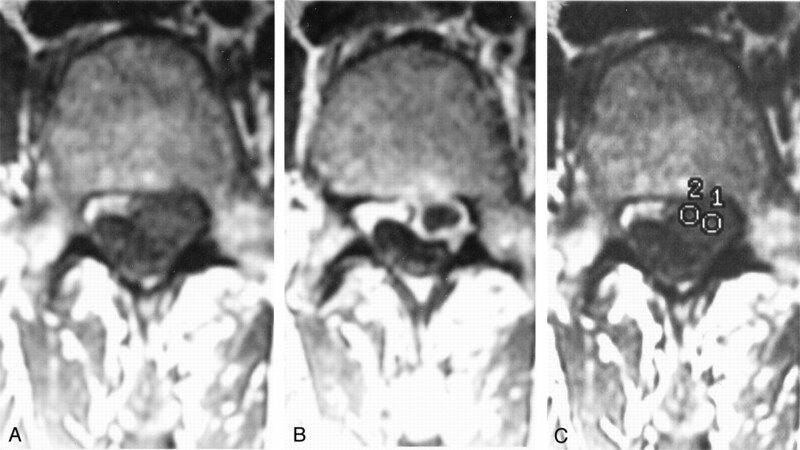 If the images suggested recurrent herniated disk, an additional axial T1-weighted MR imaging series was obtained at 20 minutes after injection and the research coordinator was notified of the patient. A radiologist reviewed the images to verify that a probable recurrent herniated disk was present and reviewed the medical records to verify that the clinical signs and symptoms were referable to the probable disk herniation. The patient was then contacted by phone and offered the opportunity to participate in a research study in which a second MR imaging study would be performed with a different contrast medium. If the patient accepted, informed consent was obtained and a second MR imaging study was performed with the identical technical factors and timing between injection and imaging but with gadopentetate (Magnevist, Berlex Laboratories, Inc., Montville, NJ) instead of gadodiamide. The maximal time permitted between imaging sessions for this protocol was 4 weeks. Technical parameters for the axial T1-weighted images included fast spin-echo-XL, 500/12/4 (TR/TE/NEX), 4-mm section thickness, 1-mm skip, 26 × 20 cm field of view, 256 × 192 matrix. For T2-weighted MR images, the parameters included fast spin-echo-XL, 3200/103/4, fat saturation, 4-mm section thickness, and 1-mm skip. The contrast medium was injected in a dose of 0.2 mL/kg. One investigator (V.H.) measured the signal intensity in each of the axial images. A region of interest cursor was placed within the disk fragment and another one in the enhancing scar tissue surrounding the disk fragment on the 20-minute image, and signal intensity was recorded. The same cursor locations were used for the 5-minute image and the baseline image, and signal intensity was recorded for each of these time points (Fig 1). Enhancement for each time point was calculated as the change in signal intensity from baseline divided by the baseline signal intensity. Average enhancement of scar and disk and contrast between scar and disk were plotted as functions of time. Differences between the two contrast media were tested for significance by using a Student t test of the means, with a level of significance set at P = .05. Contrast enhancement of disk fragment was calculated as a proportion of the enhancement by dividing the change in signal intensity in disk fragment by the change in signal intensity in scar. Means were calculated for the two groups. Significance of the differences was tested by means of a one-tailed Student t test assuming equal variance, with a level of significance set at P = .05. Twelve patients were identified who were potential candidates for the study. Three declined to participate. One agreed to participate, but because of pain and nausea, was unable to undergo repeat imaging. Eight patients were enrolled in the study (Table). The patients had undergone discectomy at L3–L4 (one case), L4–L5 (six cases), and L5–S1 (two cases). Technically adequate images were obtained in both MR imaging studies in all cases. For four of the patients, records of the reoperations were available. Large disk herniations were found in three of these patients; in one, because of the anterior approach used, the spinal canal was not explored. For all patients, enhancement of disk fragment was less with gadopentetate than with gadodiamide at both 5 and 20 minutes (Figs 2 and 3). The average enhancement of disk fragment at 5 minutes was 0.1 with the ionic medium and 0.4 with the nonionic medium (Fig 4). The difference was significant (P < .01). At 20 minutes, the average enhancement of disk fragment was 0.2 with gadopentetate and 0.5 with gadodiamide. The difference was significant (P = .02). Enhancement of scar tended to be greater with gadodiamide than with gadopentetate (Fig 3). It was 0.9 for the ionic medium and 1.4 for the nonionic medium at 5 minutes and 1.0 and 1.4, respectively, at 20 minutes. These differences were significant (P = .04 and .03, respectively). Enhancement of the disk fragment as a proportion of the enhancement of scar was consistently less for the gadopentetate than for gadodiamide (Fig 5). At 5 minutes, the proportion was 0.1 for gadopentetate and 0.3 for gadodiamide, and at 20 minutes, the proportion was 0.2 and 0.4, respectively. The differences in the proportions were borderline significant (P = .06 and .07, respectively). This study supports the hypothesis that for patients with recurrent herniated disks, intervertebral disk fragments enhance less when a nonionic contrast medium is used than when a nonionic contrast medium is used. Although differences were small, the enhancement of disk fragment was consistently less with the ionic medium and differences were statistically significant. The enhancement of disk as a proportion of enhancement of scar was approximately twice as much at 20 minutes compared with at 5 minutes. 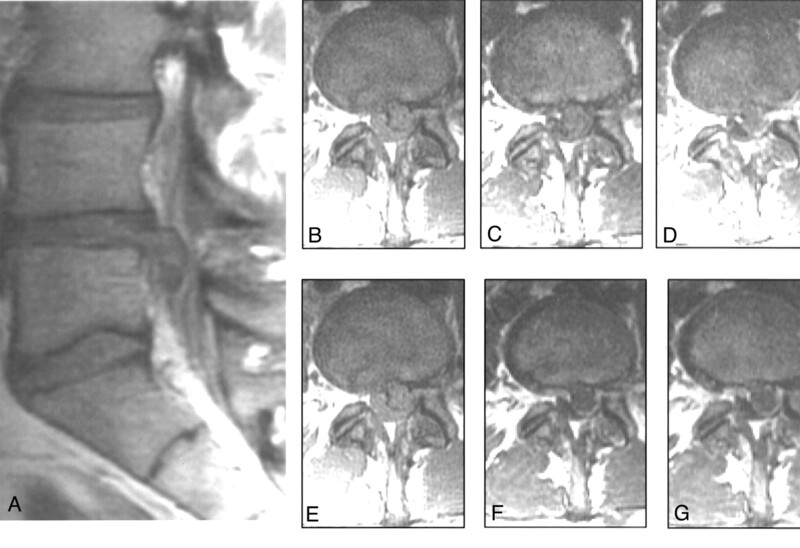 No attempt was made to assess the conspicuousness of herniated disk fragment with each medium because of the small number of patients and small differences between the enhancement patterns of the two media. The amount of enhancement of disk fragments in this study correlates well with observations in animal models. In animals, approximately twice the enhancement is observed in normal intervertebral disks with a nonionic medium in comparison with an ionic one (1). In an animal model of recurrent herniated disks, enhancement of disk fragment was calculated at 0.1 to 0.4, comparable with the enhancement in humans in the present study (2, 3). Contrast between disk fragment and scar was greater with ionic than with nonionic medium in animals (2), as it was in our study in humans. Normal intervertebral disk cartilage also enhances with IV administered contrast medium (4–6). Other factors, such as the molecular weight of the contrast medium, the concentration of glycosaminoglycans in the fragment, the dose of contrast medium, and relaxivity affect enhancement (7, 8). Greater relaxivity of the contrast medium probably explains the greater enhancement of scar with the nonionic medium in our study and in previous studies (2). The major limitation of this study was the small sample size. Because of the sample size, the statistical power of the study was small. Another potential source of error was the placement of the region of interest cursor. To sample the signal intensity in disk fragment or scar, relatively small region of interest cursors are required. Partial volume effects, inhomogeneity of scar and disk tissue, and motion between the baseline and the subsequent two series may affect the accuracy of enhancement calculations. Imprecision in the timing of the images obtained after contrast medium injection may skew the enhancement calculations. However, these sources of error are likely to produce random rather than systematic errors. Another weakness is that anatomic verification of recurrent herniated disk was obtained in only half the cases. Ionic contrast media diffuse less rapidly into herniated disk fragments than do nonionic media. For clinical imaging of patients with recurrent herniated disks, greater contrast between disk fragment and scar tissue is achieved with ionic than with nonionic contrast media. Accepted after revision July 12, 2002.